PARSIPPANY, NJ--(Marketwire - January 26, 2011) - Wyndham Hotel Group (NYSE: WYN) today unveiled new brand identity and product designs for its TRYP by Wyndham® brand, including an updated logo and public-space and guest-room designs suitable for hotel conversions and new-construction projects. While the evolved TRYP by Wyndham logo was designed to exude a contemporary feel and timeless sensibility, it remains true to the original logo by maintaining the original font, square shape and blue color, seamlessly signaling TRYP's clear positioning as a clean, sophisticated and contemporary brand endorsed by Wyndham. "The introduction of our TRYP by Wyndham global identity communicates the brand's proud Wyndham affiliation by leveraging the strong equity of the Wyndham brand name, further reinforcing the company's continued commitment to the future growth and evolution of the brand globally," said Jeff Wagoner, president of Wyndham Hotels and Resorts. The new TRYP by Wyndham interior schemes, created by New York architecture and interior design firm BBG-BBGM, reflect the brand's new guidelines with a strong emphasis on unique social and integrated guest experiences. The designs further reflect the brand's three core pillars: a cosmopolitan essence, given the brand's prime urban locations in some of the world's most attractive and cultural hotspots; Mediterranean flavor, celebrating the brand's Spanish heritage; and energetic spirit, as a hotel brand that delivers relevant amenities and a service culture designed to ensure guests make the most of their experience in the city. Public spaces at TRYP by Wyndham hotels will feature a very open lobby space called Plaza Central; a welcome area with check-in pods; and a warm, inviting atmosphere with eclectic, authentic furniture. This central seating area, designed for increased guest interaction, will serve as the main social hub for guests, featuring an interactive "blog wall" that provides information and local points of interest for guest and staff use. The hotel's gastro bar, a key component of the Plaza Central, will offer Lavazza® Italian espresso and specialty coffee drinks and a selection of international and domestic draft beers, Mediterranean wines, cocktails and beverages. Guests will be able to dine on light fare throughout the day including gourmet tapas, a small-plate food concept that will be an integral food and beverage concept across the brand. 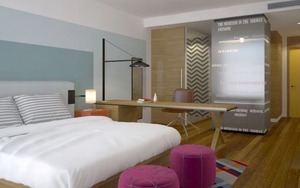 Guest rooms will offer efficient designs and graphic "word walls" with local urban references. Simple, clean and straightforward European design influences include hardwood-like floors, an open loft-like layout and a large desk. The rooms are appointed with ample outlets and lighting for a comfortable, hassle-free guest experience. Hotels also feature specialty guest rooms that have become a signature of the brand. Family rooms serve as ideal accommodations for families, featuring a large bed for parents, kid-friendly bunk beds and game consoles. Fitness guest rooms are equipped with elliptical machines or treadmills with a complimentary fitness outfit kit, providing guests privacy during their workout routines. "This is an exciting time and a perfect opportunity to unveil a fresh identity that captures the brand essence and the company's commitment to growing the brand, clearly differentiating it from its competitors while continuing to focus relentlessly on increasing customer satisfaction and maximizing operational efficiencies as an international select-service brand," said Daniel del Olmo, brand senior vice president of TRYP by Wyndham. "We feel strongly that our brand strategy will support our growth objectives, increase consumer preference among travelers looking for great locations at an affordable price and appeal to developers and hotel owners seeking a compelling alternative for existing properties or new projects in A+ locations in cities across the Americas and Europe." Amenities at all U.S. hotels will include free wireless Internet service, signature premium breakfast buffet focused on healthy meal selections and a fitness center. As part of the chain's Own the City brand culture, members of the hotel staff, or TRYP Ambassadors, will undergo continuous training to gain extensive knowledge of the city in which the property is located so they can help guests navigate key attractions as well as off-the-beaten-path venues. Travelers can anticipate seeing the updated brand identity on exterior signage on new TRYP by Wyndham hotels including the recently opened TRYP Berlin in Germany, the first to showcase the new signage, and the TRYP New York City - Times Square South, scheduled to open by the second quarter of 2011. All hotels are anticipated to reflect the new brand identity standards over the next 18 months. TRYP by Wyndham represents over 90 hotels and approximately 13,000 rooms across Europe and the Americas. The select-service, mid-priced brand currently caters to business and leisure travelers in cosmopolitan cities including Madrid and Barcelona in Spain; Paris; Lisbon, Portugal; Frankfurt and Berlin, Germany; Buenos Aires, Argentina; Sao Paulo, Brazil; and Montevideo, Uruguay. 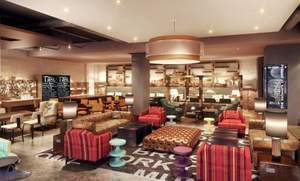 Set to debut next are TRYP by Wyndham hotels in New York City, Madrid, Lisbon and Medellín and Bogotá, Colombia. Wyndham Hotel Group acquired the TRYP hotel brand from Sol Meliá Hotels & Resorts of Spain in June 2010. Wyndham and Sol Meliá will continue to work together to develop the brand globally and market the brand through their central reservations systems and loyalty programs to offer a unique competitive advantage. Wyndham Hotel Group, LLC is the world's largest hotel company as measured by approximately 7,150 hotels and approximately 605,700 rooms under the hotel brands: Wyndham Hotels and Resorts®, Ramada®, Days Inn®, Super 8®, Wingate by Wyndham®, Baymont Inn & Suites®, Microtel Inns & Suites®, Hawthorn Suites® by Wyndham, TRYP by Wyndham®, Howard Johnson®, Travelodge® and Knights Inn®. In addition, the company has a license agreement to franchise and manage the Planet Hollywood Hotels®, Dream® and Night® brands. All hotels are independently owned and operated excluding certain Wyndham and international Ramada hotels, which are managed by an affiliate or through a joint venture partner. Wyndham Hotel Group is based in Parsippany, N.J. Additional information is available at www.wyndhamworldwide.com. Spacious, efficient TRYP by Wyndham guest rooms will reflect the city in which they are located and will feature modern furnishings as well as complimentary wireless Internet. The open TRYP by Wyndham lobby, known as Plaza Central, encourages guests to interact with each other with comfortable seating, a lively gastro bar, library area and an interactive blog wall featuring information on local attractions.